One of the previous CRRC blogs discussed some results from CRRC’s recent survey called “IDPs in Georgia” which gauged the opinions and attitudes of IDPs displaced from Abkhazia during the 1992-1993 conflict towards return, conflict resolution and justice. CRRC’s annual survey, the Caucasus Barometer (2010) also included a series of questions on Georgia-Abkhazia relations asked to the non-IDP population of Georgia. The results show that Georgians are divided on issues regarding justice and territory in the Georgian-Abkhaz conflict. 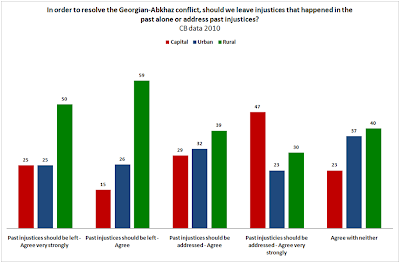 Over half of Georgians either agree and very strongly agree that past injustices from the Georgian-Abkhaz conflict need to be addressed in order to resolve the conflict, while over a third either agree and very strongly agree that the injustices of the past should be left behind. This reveals a division among Georgians in what they feel is the best way forward regarding conflict resolution. This also indicates the difficulties that policymakers face in representing the interests of the population on the issue. A closer look at the divide among settlement type reveals an interesting picture about differing attitudes between Georgians from the capital and rural areas, specifically. While the highest percentage of those who strongly agree that past injustices should be left alone are rural residents (50%), the largest percentage of those who strongly agree think that past injustices should be addressed live in the capital (47%). 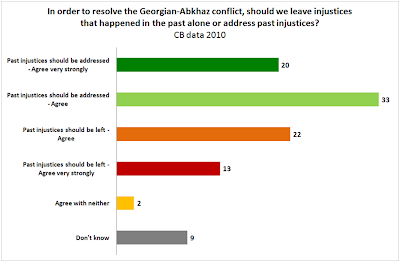 Georgians were also asked about their opinion on the prospects of returning Abkhazia to Georgian control – whether they thought that the chances had increased, decreased, or stayed the same after the 2008 conflict. Forty-one percent of Georgians say that the prospects of return had decreased, while 35% said that prospects stayed the same. Georgians, as divided as they are about how to deal with the past, seem to agree that the chances of returning Abkhazia are either the same or less than before 2008. What does this mean for Georgian-Abkhaz relations and for Georgian policymakers? How can these differences in opinion be reconciled? What makes the rural population more inclined to leave past injustices behind them and those in the capital to want injustices addressed? Check out Caucasus Barometer 2010 for more data by clicking here.